This article was guest blogged by Martin Chase, a retired NFL player who has played with the Giants, the Saints, the Redskins, the Ravens, and the Jaguars. In this article I am going to discuss the specific football drill skills you need to develop to make you look attractive to college football scouts. For maximum results, I recommend that you work on these drills with a strength coach or a professional trainer. * Vertical Jump – designed to test leg strength and lower-body explosiveness. * Broad Jump – designed to show sluggishness, heavy-leggedness and lack of explosiveness. * 225-lb. Bench Press – designed to test the upper-body strength of a player. * 40-Yard Dash – times show how explosive a player is off the line and how he maintains it. * 20-Yard Dash – times show how explosive a player is off the line and how he maintains it. * 10-Yard Dash – times show how explosive a player is off the line. * 20-Yard Shuttle – designed to test explosiveness, how a player bends and changes direction, and body control. * 60-Yard Shuttle – designed to test explosiveness, flexibility, and body control; and a subtle test of endurance. * 3-Cone Drill – designed to test a player’s efficiency in changing direction moving left and right, explosiveness, balance, body control and mobility. 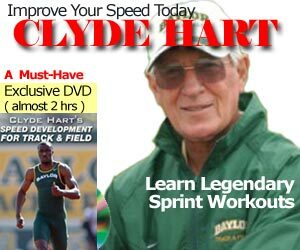 The most important skills to master are the 40-yard dash and the 3-Cone drill. The reason these two drills are so important is they help football coaches determine what positions you are best suited to play. You should know that the speed players are completing these drills has been improving every year. This is because more and more high school and college players are working with professional sports trainers to help them maximize their performance. Below I have listed the minimum times you need to have by position if you want to impress college football scouts. One thing to keep in mind for these tests is the size of the player. Smaller players should have an advantage over their bigger counterparts in regard to speed. If you are a big player, it says a lot about your athletic ability if you perform well in these drills. In summary, to become a professional football player, you must master the skills colleges and NFL teams use to measure the quality of an athlete. If you want to make it to the NFL, you should work with a professional sports trainer to help you maximize your performance so you can achieve and exceed the drill speed times discussed above. Other athletes are doing this and for you to compete with them, you need to do it too. Martin Chase is a retired NFL player who has played with the Giants, the Saints, the Redskins, the Ravens, and the Jaguars. Martin now owns and manages a popular sports memorabilia website – www.mcsportsfan.com. my name is ricky ortiz i am coming out of high school and i would like to know what is a good time for the 3 cone drill? 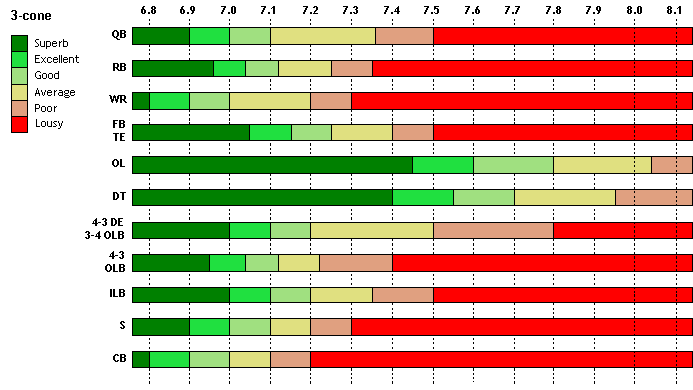 Here is a better chart.. are you in the “average” scores (in yellow)? hey my name is deonte and im a personal trainer working under the world taekwondo center in columbia sc i was interested in doing combine training do you have any infomation that i can have to study and learn about all combine training not just football that would be helpful if you guys could help me….. I was wondering if you have other charts to check for 60yrd Shuttle test.